Paperback, Published in Dec 2007 by VDM Verlag Dr. Mueller E.K. The stories of roughneck pirates roaming the decks of black-flagged vessels have fascinated readers of all ages since their early beginnings and have shaped today's common conception of pirate life and sea adventures. 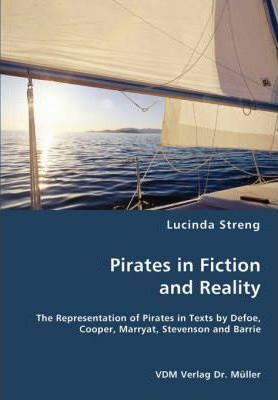 By examining the representation of pirates in Daniel Defoe's 'Captain Singleton', James Fenimore Cooper's 'The Red Rover', Frederick Marryat's 'The Pirate', Robert Louis Stevenson's 'Treasure Island' and J.M. Barrie's 'Peter Pan', the author not only compares the image created by fiction to the reality of the 'Golden Age of Piracy', but tries to answer the question of why, after more than 200 years, people are still fascinated by vicious pirate captains on awesome vessels and deserted Caribbean islands. The thesis casts a glance at the legends behind the stories of Silver, Hook and Co. Were they really mythical figures or simply ill-mannered searobbers that did not live up to their reputation?